The other day, I sat silently watching a moth sputter furiously at the window in front of me, trying desperately to get out through the pane of glass that prevented its flight. 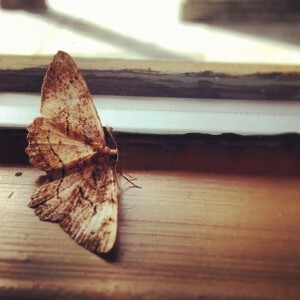 The delicate, mottled brown wings looked like blurred sand as they fluttered against its taunting prison walls. Suddenly, it stopped, and sat unmoving in confusion on the sill and I could see more clearly the darker lines spanning from one edge of its papery wings to the other. I imagined them as the lines of rivers crossing an Old World map, or the sediment layers stretching across the Grand Canyon to mark the passage of geologic eras. Two thin, feathered antlers protruding from the moth’s head like golden ferns navigated the air around its body but could not discern the impossible glass that held it captive. It was like a reflection of my own struggle in the previous 48 hours, in which the things I could see were quite clear and my desire to move forward was strong, but an invisible barrier held me sputtering in place, banging my head against the confusion.